The North West Hospital, Parkville Campus (formerly Mount Royal Hospital) consists of a complex of buildings constructed and modified over a long period of time, the earliest being from 1874-75. Privately leased from 1863, the land was assumed in the 1870s by the government to build a training school and benevolent home for homeless children. The nucleus of the building at Royal Park was erected in 1874-75 by Pearson and Downie for the Public Works Department. The first building was used as a girls' industrial school until a change of government policy in 1880 abandoned the concept in favour of the 'boarding out' of homeless children. After temporary use as a boys' industrial school the building was left vacant in 1881-82. In 1882 the former Industrial School became the new home for male 'Houseless and Destitute Persons' under the aegis of the Immigrants' Aid Society, and within two years was recognised as also serving a hospital function for the aged. In 1902 the name changed and again in 1932 the institution's name was changed, to the 'Victorian Benevolent Home and Hospital for the Aged and the Infirm'. A substantial building programme over thirteen years from 1926 was evidence of that change of status. 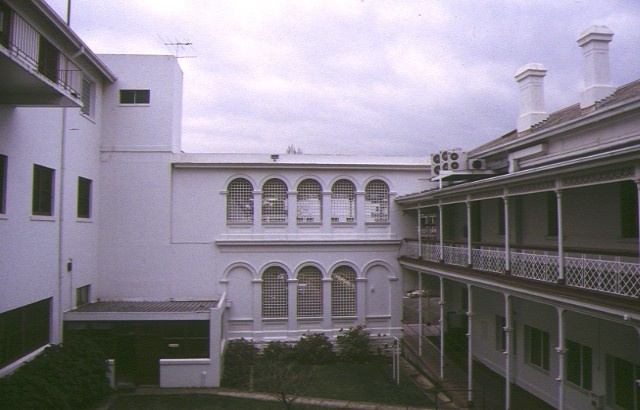 Echoing the two-storey courtyard effect of the original building was the Women's Division Building (1936). The Nurses' Home (1926, extended 1938-39) was also designed on a scale commensurate with the 1874-75 building. Extensive landscaping works at that time were designed to give unity and dignity to the complex. Further additions and alterations, many in an ad-hoc fashion, have been made since that time. The North West Hospital, Parkville Campus (formerly Mount Royal Hospital) is of social, historical and architectural significance to the State of Victoria. 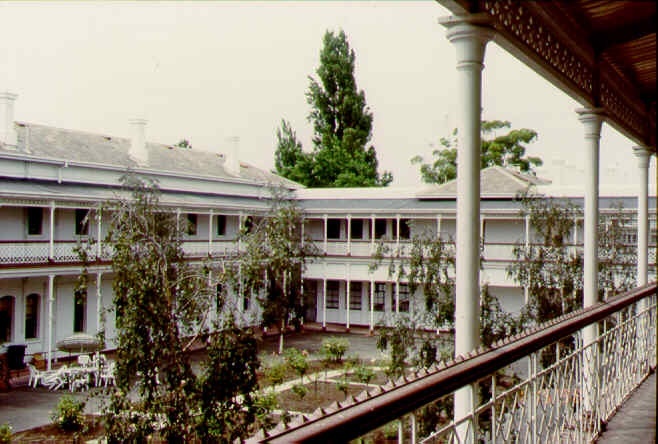 The North West Hospital, Parkville Campus (formerly Mount Royal Hospital) is of social and historical importance for its origins on part of the site of a former Model Farm; and for its tangible associations with several institutions of great significance in the history of social welfare in Victoria. It is the direct successor to a unique and invaluable institution in colonial society, the Immigrants' Aid Society. The Society gave shelter and support to many indigent and unfortunate new arrivals in Victoria at the time of the gold rushes and then evolved into a foremost charitable institution taking responsibility for the aged. 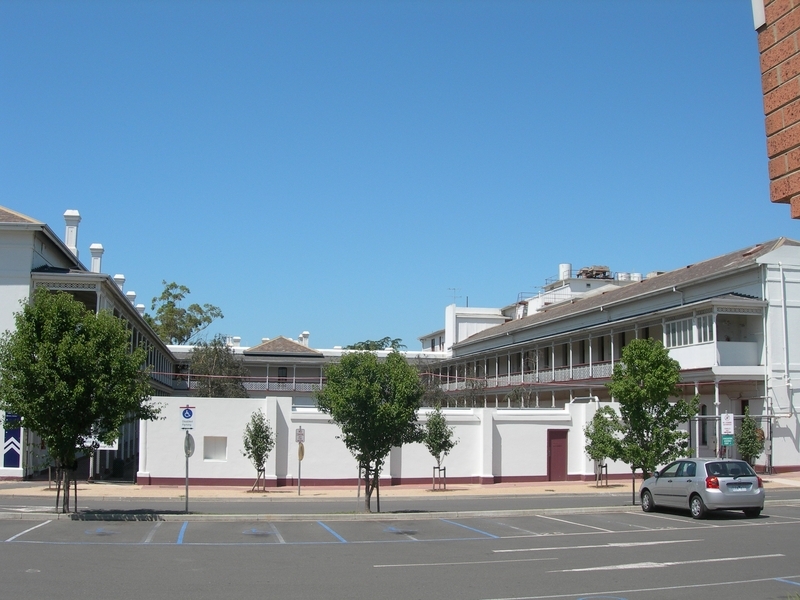 The Hospital has been intimately and continuously involved with the development of aged care and rehabilitation at this site since 1882 to the present day. The site is also of significance for its association with the Industrial School (one of only three built in Victoria. The major buildings and landscaping of the Hospital reflect not only the evolution of the institution itself but also the changing approaches to care of the aged and infirm. The place itself is of historic interest for its association with a Model Farm which once existed on site. 142 acres were excised from the Royal Park reserve by the Victorian government in 1858 to establish a place to demonstrate and test farming methods. There is no certain evidence of any landscape or structural features remaining from that time. The North West Hospital, Parkville Campus (formerly Mount Royal Hospital) is of architectural importance for the 1874-75 buildings, particularly the fine internal courtyard. It is an important reflection of government policy towards dealing with the problem of homeless children in that era. A detail of special note is the rare wrought iron lattice work used in the arches of the upper walkway. Of associated importance is the complex of major buildings, notably the Women's Division, the Nurses' Homes and the Ambrose Pratt Memorial Chapel which illustrate the changing use of the site from 'Industrial School' to 'Home of the Aged' to a specialist geriatric hospital. Of interest are two timber pavilions of uncertain provenance situated in the garden, one of which was used as a receiving office for inmates during the 1930s, while the other may have been a cabmen's shelter moved to the hospital for use as a shed or shelter. North West Hospital, Parkville Campus (formerly Mount Royal Hospital), Poplar Road, Parkville, City of Melbourne. 1. 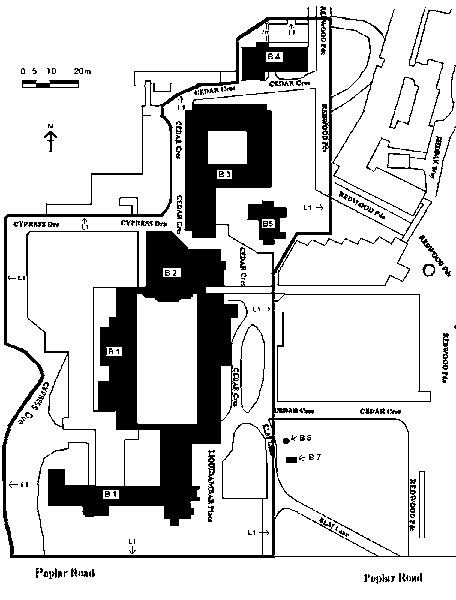 To the extent of all the buildings known as former Industrial School (B-1), Kiosk and Concert Hall (B-2), former Women's Division (B-3), former Nurses' Home (B-4), Chapel (B-5), Timber Garden Structure (B-6) and Timber Shed (B-7) on Diagram 603562 held by the Executive Director. 2. To the extent of all the land marked L-1 on Diagram 603562 held by the Executive Director, being part of the land described as Reserve 9297, Allotment 3A, 3B and 3C, Section 99A, Royal Park, Parish of Jika Jika. Mount Royal hospital has changed its name numerous times and was originally known as the Immigrants Aid Society. On the 9th of May 1853, as a result of a public meeting held on this date, the Immigrants Aid Society was formed. Its original objectives were to provide information for new arrivals, erect temporary buildings and provide free lodging. It sprang directly from the needs of unfortunate immigrants arriving as a result of the gold rush without adequate means of shelter. The first meeting was chaired by John Hodgson, MLC and Mayor of Melbourne (Jean Uhl, 1981, p. 3). It was decided that the Immigrants Aid Society should include a hospital or sick ward under medical supervision and thus it became the second hospital established in Melbourne. There was only one other hospital operating in Melbourne at the time (1853). In October 1853, a medical office was established on the corner of Swanston and Collins Streets on the Town Hall Reserve. There was also a dispensary and sick ward elsewhere (Jean Uhl, 1981 p.6). The Immigrant’s Aid Society became the foremost charitable institution in Melbourne in the 1800s as it managed to run a home for houseless and destitute people, a school for children, a night refuge, a cancer hospital, a soup kitchen as well as provide outdoor and indoor employment for many ‘souls’ who came to its doors (Jean Uhl, 1981 leaf of front cover). The Society first occupied a building at the foot of Batman’s Hill which had been the city abattoir. Although established in 1848, it was already inadequate by the time the Immigrants Aid Society was established. In 1854 Royal Princes Bridge Barracks just south of the Yarra was vacated by the 40th Regiment and the Immigrant’s Aid Society were allowed to take possession of them. Gradually it extended its wooden buildings which extended down both sides of St Kilda Road, sites now occupied by the Police Hospital, the National Gallery, Government House and the Domain. In 1873 it was announced that a new Government House was to be built on the Domain where the Society was situated. Six months later on 8 June 1874 a notice was served on the society to remove its buildings from the site (Jean Uhl, 1981 p.95). The society was officially obliged to remove their male permanent division four miles away to Royal Park where they were to take over empty, dirty, echoing buildings that had remained unused for two years. These had been abandoned by the Industrial Schools in 1880 because the numbers of children formerly housed there had dwindled away due to the boarding out system which came into force in 1880 (Jean Uhl, 1981 p.102). Children for many years were part of the Society’s special concern especially where education was concerned, due largely to the thinking of the Education Department that children of the destitute did not need educating (Jean Uhl, 1981 p.102). It was this inadvertent association with neglected and destitute children in the early days of the Society’s foundation that connected the Society with the origin and development of what was to become in latter years ‘The Children’s Welfare Department’. The Government’s arrangement for the Society to care for children, neglected and destitute, ceased in 1864 with the passing of the Neglected Children’s Act (Jean Uhl, 1981 p.103). About 1858 an area of 142 acres in the north-west corner of the original Royal Park was set aside as an Experimental Farm area. A few years after 1866 part of this farm was set aside for the building of an Industrial School, which was then carried out (Jacobs, Lewis, Vines, 1979, p.170). The nucleus of the Mount Royal Home for the aged was erected in 1874-75 by Pearson and Downie for the Public Works Department. It was originally known as the Royal Park Industrial School and served as a State operated benevolent institution for homeless children. Industrial Schools were established under the Neglected and Criminal Children’s Act of 1864. With the establishment of this act about 468 children were transferred from the Immigrants Home to the care of the Gov. Superintendent and into Industrial Schools (Heritage Victoria File letter from Stephen Murray Smith). In 1873 great plans for a new Industrial School to be erected at the Model Farm were formulated and described as ‘now ready’. The plans architecturally were magnificently designed and prepared, and the whole concept if built, would have been a monument of the concern in the nineteenth century to neglected children. Only half of the original proposal was actually built. 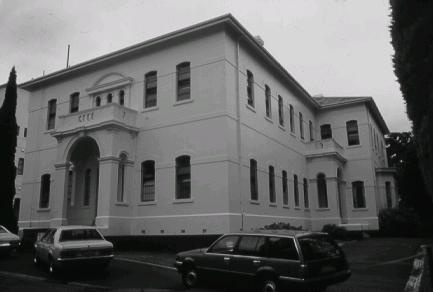 Buildings were to accommodate 300 girls who were still housed at St Kilda Rd School, and 300 boys to be accommodated in a separate building. Sixty to seventy boys were to remain at St Kilda Road because they were employed in the Botanic Gardens, Albert Park and the Government Domain and the Government considered it necessary for them to reside near their work (Jean Uhl, 1981 p.103). About 1876, the Geelong Industrial School was closed and the children transferred to the Royal Park School (Heritage Victoria File letter from Stephen Murray Smith). In his Report on the State of Public Education in Victoria in 1877 Charles H. Pearson refers to the Royal Park establishment as a large building containing about 200 girls, many of who suffer from eye and skin diseases. They learn housework and the use of sewing machines. Nearby is a small farmhouse with outbuildings and a few acres of farm, where boys from the Sunbury Industrial School work while jobs are being found for them. Pearson was scathing on the low moral tone of these establishments, the mixing of children from respectable and vicious families, and other evils. The Industrial school boys were initially housed in the old Model Farm buildings which were then part of the Calf Lymph Vaccination Depot. One year after the men of the (Immigrants Aid) home had been moved to the Industrial School buildings at Royal Park, it became necessary, on Government orders, for the boys to be transferred to ‘The Hospital’ of the Industrial Schools which was by then being used by the Home (1883) (Jean Uhl, 1981 p.102). The building was occupied by the Industrial School for only five years following a change in government policy, after which it remained vacant for two years. The Immigrants Aid Society was officially obliged to remove their male permanent division four miles away to Royal Park where once again they were to take over empty, dirty, echoing, disused for two years buildings. These had been abandoned by the Industrial Schools in 1880 because the numbers of children formerly housed there had dwindled away due to the boarding out system which came into force in 1880 (Jean Uhl, 1981 p.102). The superintendent also took care of the Industrial School Boys still working at the Model Farm. The boys helped to produce maize, oats and root vegetables and look after eighteen cows and unnumbered pigs. The boys were initially housed in the Model Farm buildings which were then part of the Calf Lymph Vaccination Depot, described as a miserable erection. One year after the men of the home had been moved to the Industrial School buildings at Royal Park, it became necessary on Government orders, for the boys to be transferred to ‘The Hospital’ of the Industrial Schools which was by then being used by the Home (1883) (Jean Uhl, 1981 p.102). When the Male Division was transferred to Royal Park it appeared to be a suitable moment for a further change of title. ‘Refuge for Homeless Persons’ was suggested but never officially adopted. It was not until 1902 that the image of the Society’s work was changed substantially by adopting the name Victorian Home for the Aged and Infirm, a title which remained until 1926 when with additions to the site, the title again reminded the populace of a different kind of work then being undertaken. It was now to be ‘The Victorian Benevolent Home and Hospital for the Aged and Infirm’. From then on, the public was made aware that the Home was also a Hospital (Jean Uhl, 1981 p.104). Under the provisions of the Hospitals and Charities Act, 1922, the first time the word ‘Hospital’ was added to the title of the institution when it was changed from Victorian Homes for the Aged and Infirm to the Victorian Benevolent Homes and Hospital for the Aged and Infirm in 1925. With the Board of Management’s approval, the Inspector of Charities had pointed out in 1884 that the Homes consisted of a Benevolent Division and a Hospital and at last in 1925 ‘the name fully explained the objects of the Institution’(Jean Uhl, 1981 p.130). It was perhaps this change of name which precipitated the Government into listening to the pleas of the committee regarding nurses and nursing accommodation. A Nurses’ Home opened by the Mayor of Brunswick, Cr J.M.Balfe, on 28 April 1926, made the general public aware that the large structure in Royal Park which some considered ‘barrack-like’ was not an institution for old down-and-out men but was also a Hospital where nurses cared for the aged sick who had no one else to care for them. The Myer Emporium donated all the floor coverings for the new Nurses’ Home. The quarters contained eleven bedrooms, dining room, and sitting room, kitchen and other offices. One hundred pounds was contributed from the Edward Wilson Fund towards furniture. The nursing staff of eleven who initially occupied this nurses home were used in Ward 9 where the most serious male cases were accommodated (Jean Uhl, 1981 p.130). The new hospital block was formally opened on 14 December 1932 by the Hon. E.L. Kiernan, M.L.C., acting for the Premier, but by the following June only one wing was furnished and occupied (Jean Uhl, 1981 p.147). 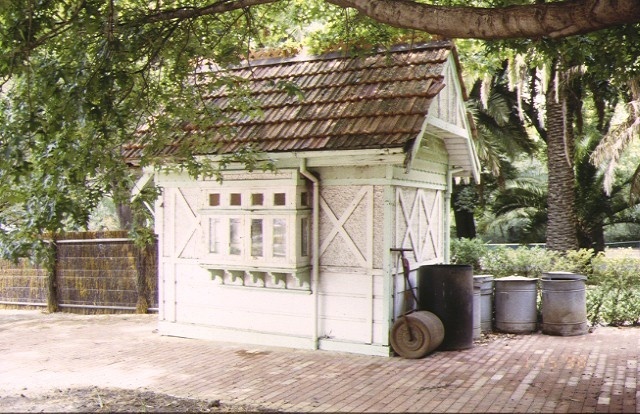 The First Auxiliary’s kiosk was built in the main quadrangle and officially opened by Lady Somers on 16 June 1931. In this period many foundations were laid which were to prove the cornerstone of so many valuable contributions to the welfare of patients (Jean Uhl, 1981 p.147). The building of a new infirmary block with forty additional beds was accomplished in 1935 and the anomalous position of female accommodation was, it was fervently hoped, soon to be corrected (Jean Uhl, 1981 p.148). It was the eighty-third year of operation for the Victorian Homes in 1936 and only then were plans approved for remodelling and extending the Women’s Division. 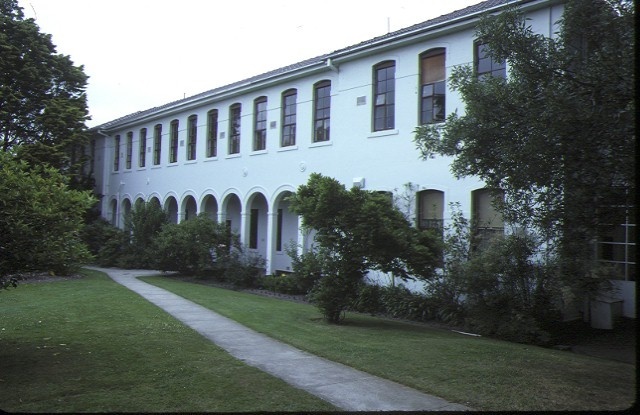 The new block was planned round a central open quadrangle with an internal two-storey verandah and on the north side a sun verandah running the length of the building. It was to serve both walking and bed patients and have a dining room and lounge. A lift went to the upper storey so that patients could be received near the ambulance entrance and taken direct to the wards. This was another sign of a planned environment instead of a past inheritance of buildings not designed for the purpose for which they had necessarily to be used (Jean Uhl, 1981 p.148). The forty-four hour week when introduced, again pointed to the inadequacy of accommodation for nursing staff and a new wing was built at the western end of the Home. 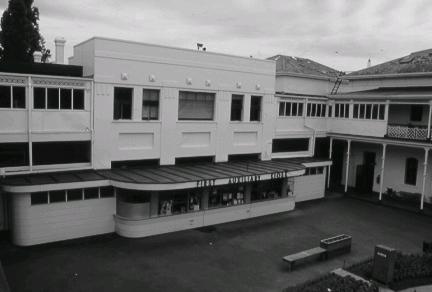 In acknowledgment of the great work of the first Auxiliary and its continuing President for the past eighteen years, the wing was named ‘The Grace Eastgate Wing’ and officially opened on 13 June 1949. When the Forty-hour, five-day week was introduced this again necessitated an extra storey being erected on the existing nurses’ home - this was completed and occupied in May 1950. With new additions and a new look as a prerequisite for entry into the next decade, lingering reminders of the past had to be dispensed with (Jean Uhl, 1981 p.173). Another significant change took place on 1 May 1949 when the First Auxiliary handed over their canteen kiosk, which it had run so successfully for eighteen years. It was fully stocked (Jean Uhl, 1981 p.174). Buildings and equipment in many directions were renewed, repaired and refurbished by the end of the 1940s and considerable progress made towards overtaking the four-year lag in maintenance. Once again the ladies of the First Auxiliary came to the rescue by refurnishing the wards in the Benevolent Division especially. The committee of management who since August 1946, had been able to hold all their meetings in the board-room at Mount Royal instead of the Melbourne Town Hall (Jean Uhl, 1981 p.174). A wise move was made at the same time as the plans for the Geriatric Unit were put before the Hospitals and Charities Commission. Although the committee realised that money would not be forthcoming at that stage for any further undertakings, the necessity for alterations and additions to the Intermediate Block and a new office section as well as remodelling of wards would soon become urgent. Plans for all these projects were submitted so that when finance was available, work could be undertaken without delay (Jean Uhl, 1981 p.182). The first project honoured Ambrose Pratt who was one of many who gave of his talents and his time. He joined the committee in 1938 and was vice president when he died in 1944. One of his dearest wishes was to see a chapel to serve all denominations erected in the grounds of Mount Royal. The committee realised that a chapel to serve all denominations erected in the grounds of Mount Royal. The committee realised that a chapel ‘was essential for those who, in the evening of their lives, seek care and shelter at the Home’. It was not until 1953 that those first ideas in 1944 for the building of a chapel were set in motion (Jean Uhl, 1981 p.182). The architect for the Chapel was Mr Plottel and the successful tenderer was builder F.T Jeffrey. Early in January 1954, the foundations of the chapel were laid in the garden which had been created after the demolition of the old concert hall. The chapel was officially opened and the memorial tablet unveiled by Sir Edward Hallstrom, Kt, of Willoughby, Sydney on 5th May, 1955 (Jean Uhl, 1981 p.183). The chapel stands as a memorial to Ambrose Pratt and to all those who helped in numerous ways to see that it was built. Designed to seat 100 people, its vaulted ceiling in the chancel and open timber-roofed nave make the chapel an oasis of quiet amid the bustle of activity always present in the running of a hospital. What is now North West Hospital has stemmed directly from the Immigrants Aid Society. The Immigrants Aid Society should be regarded as a permanent memorial of the feverish days of the gold rush, since it sprang directly from the needs of unfortunate immigrants arriving without adequate means of shelter. The complex of buildings demonstrates and can provide insights into many aspects of the history of social welfare in Victoria as they developed in parallel with government attitudes to welfare. No other Melbourne hospital began in such peculiar circumstances, and has managed to survive in spite of varying tides of fortune. The hospital has an interesting history of development not seen in any other institution, having developed from Immigrants Aid Society to Geriatric Hospital. The Immigrants Aid Society demonstrates uniqueness as it is the only society of its type known to exist in Victoria. The rectangular timber pavilion on the site is possibly a cabman's shelter and if so would be rare and important as these buildings often did not survive. The internal courtyard of the 1874 buildings is particularly rare. It is unusual in being only half of a larger scheme. A detail of particular note is the rare wrought iron lattice work used in the arches of the upper walkway. 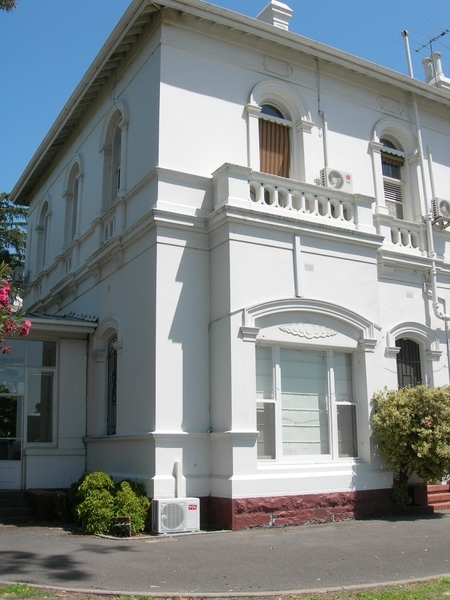 The complex of buildings demonstrates and can provide insights into many aspects of the history of social welfare in Victoria, including the Immigrants Aid Society, Industrial Schools and Geriatric Care. The site demonstrates the role of charitable organisations in the history of Melbourne and the ad hoc way they developed with the changes in social welfare policy. The internal court yard of the 1874 building is particularly rare. It is unusual in being only half of a larger scheme. A detail of particular note is the rare wrought iron lattice work used in the arches of the upper walkway. The complex of buildings are important for their physical manifestation of the changing requirements and role of the hospital from Industrial School to Immigrants Aid Society and then to Geriatric Home. Of interest are the two timber pavilions situated in the garden, one which was the receiving office for inmates during the 1930s and the other which may have been a cabman's shelter moved to the hospital site to be used as a garden shed. The Immigrants Aid Society went on to become the foremost charitable institution in the 1800s. It was the society's association with neglected and destitute children in its early days which connected it with the origin and development of what was to become in latter years, the Children's Welfare Department. The hospital has strong connections with the Industrial School System as the buildings occupied by Mount Royal after 1882 were originally constructed as the Industrial School, Girls Division. replacement of sanitary fixtures and associated piping, mirrors, wall and floor coverings. skirtings and architraves and provided that the location of the heating unit is concealed from view.